doctoral student at the Institute of Art of the Polish Academy of Sciences in Warsaw, graduate of the the Faculty of Theatre Studies of the National Academy of Dramatic Art in Warsaw and the Institute of Applied Social Sciences of the University of Warsaw, Sheworks in the Theatre Institute in Warsaw. She has published in Teatr, Scena, Didaskalia, Nietakt!, Studia Litteraria et Historica, teatralny.pl, as well as in several collections including Przestrzeń w kulturze współczesnej. Literatura. Teatr. Film (2016) and Teatr historii lokalnych w Europie Środkowej (Katowice, 2015). She was an editor and originator of the anthology of contemporary Polish drama Ikony, pseudoherosi i zwykli śmiertelnicy (2015). In her research, she studies the presence of ‘weak thought’ and the issue of weakened subjectivity in post-modern culture, as well as narrative and space in contemporary Polish drama. 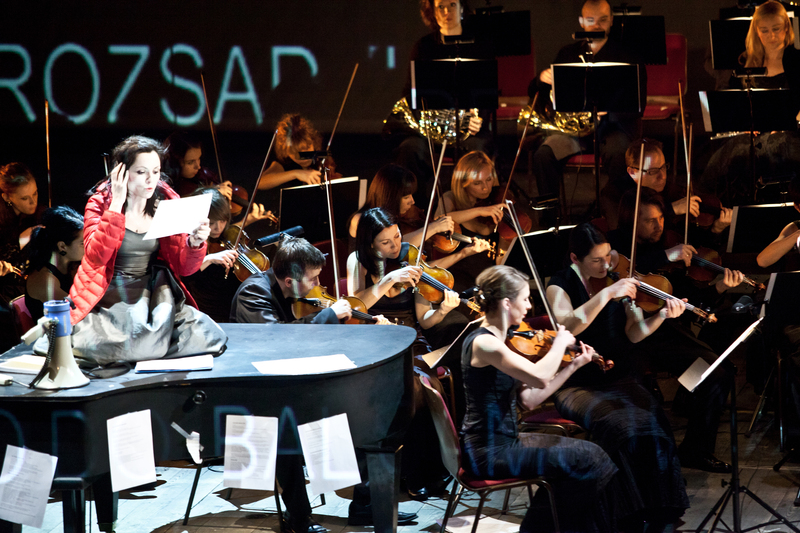 CHOPIN WITHOUT PIANO, directed by Michał Zadara, premiere: 23.03.2013, produced by Centrala. Photographer: Natalia Kabanow. Founded in 2013 by director Michał Zadara, Centrala Theatre is a rarity in the Polish theatre system: an example of a company aspiring to the status of a non-public arts organization; a private theatre crediting itself with a public mission as it pursues non-profit, non-commercial artistic endeavours. The present article is a peculiar case study assuming the perspective of institutional critique – as expressed in the thoughts and observations of Bojana Kunst, Kuba Szreder, Luc Boltanski and Eve Chiapello, Gregory Sholette and others - to examine how Centrala operates. I focus on the following issues: Centrala’s co-operation with public institutions, production relations within the company, the peculiar way in which artists who are part of Centrala understand public mission – and the neoliberal, ideological base on which the theatre operates, and which stems from the fascination with contemporary marketing and management techniques. The text also attempts to answer the question whether a free-market approach and carrying out a public mission can be reconciled. 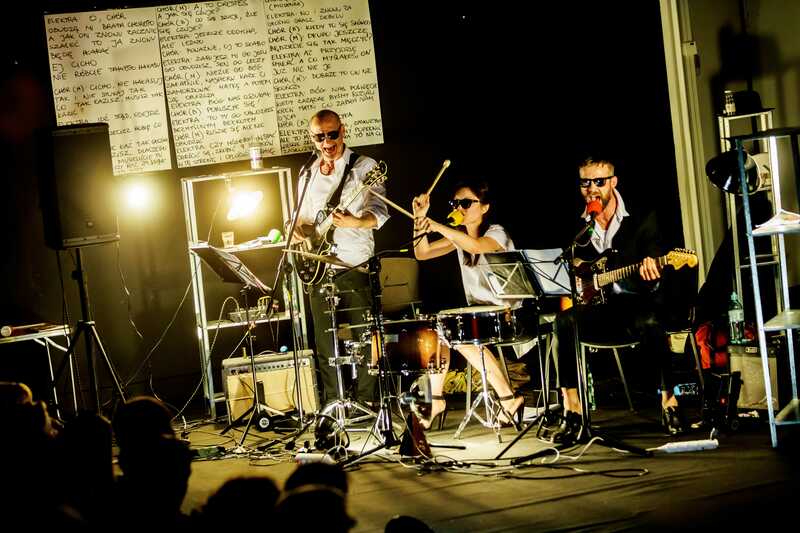 Centrala is a theatre production collective founded in 2013 by the prolific Polish theatre director Michał Zadara. Up to 2016, it included Zadara and Krzysztof Bieliński (photographer), Arkadiusz Brykalski (actor), Anna Czerniawska (dramturgy, production), Jan Duszyński (musician), Marta Kuźmiak (management, production), Robert Rumas (set designer and visual artist), Artur Sienicki (lighting designer and technician and video artist), Arek Ślesiński (costume designer), Barbara Wysocka (actor and director), Magdalena Zadara (design, translation, IT) and Oliwia Ziębińska (logistics, documentation, design).1 The collective’s work is interesting from the point of view of institutional critique in large part because it is a rare example in the Polish theatre system of a private company carrying out a public mission and pursuing non-profit, non-commercial artistic endeavours. Centrala, according to its creators, strikes at the 'ossified structures' of artistic institutions, while at the same time collaborating intensively with them by 'finding ways to flexibly harness the resources of various entities in the process of making art'.2 Simultaneously, it considers itself an institution with a clear-cut mission. What precisely does it mean that Centrala has a public mission – how do the artists involved understand that mission and how do they implement it? What does Centrala’s structure look like – is it similar to state institutions, or does it operate on totally different principles? Why does Michał Zadara, the initiator of the enterprise, insist on this type of artistic and financial risk? In my article, I wish to analyse Centrala’s operations through the prism of institutional critique, basing my study on two informal interviews I conducted with Centrala3 members, and on other statements published in the press, along the collective’s artistic activity, both as observed personally and as described in the media. Contemporary theatre companies can be divided in terms of their organizational structure into public and non-public. Public theatres – the so-called first sector –are financed by their organizer’s earmarked subsidies and include national theatres, marshal’s office theatres, municipal and county theatres. According to Theatre in Poland, an annual publication documenting theatre life in Poland, there are a total of 120 such theatres.4 There are also non-public theatres, divided into commercial ones (the so-called second sector), which are profit-making businesses, and third-sector theatres functioning as NGOs – foundations and associations. These two latter sectors total 384 theatres. The data recorded in Theatre in Poland points to a steady increase in the number of theatres in the private sector and within the third sector, as well as to the stability of institutions maintained by permanent public subsidies. Centrala’s members see their organization as one of ‘non-public cultural institutions’, the idea of which arose during the 2009 Congress of Culture. Komuna// Warszawa also terms itself as such – a theatre company operating since 2009 as the 'posthumous child and heir of Komuna Otwock, founded in 1989 by Grzegorz Laszuk and Paweł Stankiewicz. Other examples of non-public cultural institutions include the Institute of Performative Arts, created from Komuna// Warszawa’s resources. Originally, this was intended to be a producing entity, dealing with the production of works by other collectives. Unfortunately, since its foundation in 2013, nothing has surfaced about the Institute’s activities, which is certainly due to it's lacking a permanent venue – its founders counted on being granted one by the Warsaw municipal government. Adam Sajnuk and Aldona Machnowska-Góra define their WARSawy Theatre (previously known as Konsekwentny Theatre) as a non-public cultural institution, in operation since 1997. This institution, resembling a typical repertory theatre, differs from most public theatres in that it maintains no permanent ensemble, but rather a fixed company collaborating with the theatre on a project basis. It also does not have its own workshops or ateliers – it outsources those aspects of production. It is known for frequently changing its venues and relocating its headquarters. However, what distinguishes these three organizations from public theatres the most is the lack of permanent public funding. As mentioned above, the idea of a non-public cultural institution, known for decades in Europe, was developed in Poland during the 2009 Congress of Culture by a team led by the economist Jerzy Hausner and Prof. Hubert Izdebski, a lawyer. The essence of this concept is based on a free cultural market, in which three sectors are to compete for public funding: public, non-governmental and private. Cultural institutions are founded and run not only by state and local governments but also by foundations and associations, private individuals and entrepreneurs. In this system, earmarked subsidies were supposed to be replaced by designated subsidies. They are also not subject to a number of legal conditions determining work in public institutions, which makes their way of functioning considerably more flexible. The second stage of Centrala’s development was the small-scale production Jesus Christ the Saviour. In 2012, festival director Bartosz Szydłowski commissioned a new production from Zadara for his Divine Comedy Festival in Kraków. The festival management spent a modest amount on the production and rehearsals took place in Warsaw, at the Dramatyczny Theatre in Warsaw, which was co-producer. Another production was created in a similar way – by engaging two institutions, with a small financial contribution on their parts: Chopin Without Piano (2013, Juliusz Słowacki Theatre in Kraków, GAP Artistic Agency). It was an acclaimed, unprecedented production featuring Chopin’s piano concertos without a soloist at the grand piano. Accompanied by Sinfonietta Cracovia with conductor Jacek Kasprzyk, Wysocka performed the piano parts rewritten as a literary text created on the basis of interviews with pianists, musicological publications, biographies and letters by Chopin. The production, along with its experimental dimension, also presented a critical view of Polish culture, drawn from writings by Stanisław Brzozowski and Friedrich Nietzsche. It demythologized the figure of Chopin as a great patriot. Chopin Without Piano achieved considerable success – it was presented and awarded prizes at top Polish festivals: the Chopin and his Europe festival in Warsaw, Divine Comedy in Kraków, Counterpoint in Szczecin and the Festival of Pleasant and Unpleasant Plays in Łódź. It also toured the United States (Philadelphia, Swarthmore College, Boston) and was presented in Russia. Trailer for CHOPIN WITHOUT PIANO, directed by Michał Zadara, produced by Centrala. The GAP Artistic Agency and the encounter with Prof. Jerzy Hausner turned out to be the way forward, and I shall return to this later on. GAP agreed to the non-standard production (as did the Juliusz Słowacki Theatre in Kraków, which provided the production with space and backstage facilities without charge), and the agency has regularly supported subsequent Centrala projects ever since. The example of Chopin Without Piano indicates a model situation as far as Centrala’s principles are concerned, wherein the work dictates its organizational structures and modes of production. – and Oresetes (2016, Zachęta National Art Gallery), a production about democracy told through the prism of Euripides' tragedy. These productions vary a great deal in their subject matter, but most take up political themes and reveal similarities at a formal level. Centrala’s productions are inexpensive (budgets are usually under five thousand euro), are for the most part intimate and require small casts – much different from large-cast, multi-hour productions staged by Zadara with institutional theatres. They are defined, as Zadara phrases it, by 'lightness' – achieving maximum effect with the lightest means possible. In Szapocznikow: No Gravity, the main set-design elements are a parachute and three fans – it feels monumental, yet can fit into one crate. The set for Orestes fits into two crates, the set for The Warsaw Row – featuring several simultaneous performing spaces – is stored in Zadara’s garage. Sets, as Centrala members state anecdotally, must fit into a Ford Transit or other small car, and must be mounted by the Centrala team, which after all doesn't include professional stage technicians. WARSAW ROW, directed by Michał Zadara, premiere: 1.08.2011, Warsaw Uprising Musuem, produced by Centrala, co-produced by the Warsaw Uprising Museum. Photographer: Ruby Yeo. Traces of that are visible in the way the Polski Theatre production was received. Witold Mrozek, in his review, sees in Forefathers’ Eve a multimedia museum.15 Katarzyna Czeczot16 notes in her review that the production is attractive, full of changes of pace, tone and convention, but it completely overlooks the politics inherent in Forefathers’ Eve – by showing it in its entirety, the production departs from a critical reading of the text. This enthusiastic inscription of theatre into the logic of late capitalism, however, reveals some disturbing tones. The experience emphasized by Zadara can be juxtaposed with sacral consumption processes described by Giorgio Agamben in Homo Sacer and Profanations, consisting of practicing the ritual of purchase, sale and exchange of goods. These include tourism, one of the biggest 'industries', processing hundreds of millions of people through its machine. Tourism is a desperate experience, carrying with itself a confrontation with 'irreversible loss of any utility and absolute inability of profanation'. The audience at Forefathers’ Eve are like tourists, moving through a museum-like world, and according to Agamben the museum is 'a separate dimension to which we transfer that, which we no longer recognize as real and fundamental'.17 Such can be the effect of giving up on politics and focusing on the production and sale of cultural experience. Outside the context of Centrala, Zadara has directed a production which takes up the institutional critique of opera: Dla głosów i rąk [For Hands and Voices] set to the lyrics and music by Jagoda Szmytka, a young contemporary Polish composer.20 The production describes the problems of a state institution of culture, a giant producing and promoting machine, by showing scenes from opera life during the production period. Characters resembling the management, assistants and marketing-department employees of Teatr Wielki – Polish National Opera appear on stage. The subject is the power structure in opera and its influence on artistic activity. It is also about the journey an avant-garde composer must go on to see her piece staged. As Bojana Kunst writes, 'the core of contemporary work is visibility (visible effort)'.21 In Centrala's The Ward. the tech crew moves the set around the stage in plain sight, performers walk around in private attire and animate puppets in a puppet theatre, destroying at the same time its illusory quality. In All Backs Were Turned, actors operate lights and play instruments, operating the entire staging machine on the stage. And in Szapocznikow: No Gravity, the actors – Wysocka and Adam Szczyszczaj – operate the lights, move the set and its key element, the parachute that's spread above the stage. Despite such strong emphasis on production process and self-reflectivity, however, Centrala productions do not problematize the work methods, as do stage works by Xavier Le Roy, Jérôme Bel, Janez Janša and Via Negativa, as Kunst describes. These artists are among those who have shaped, according to Kunst, the understanding of politics in contempoary theatre, consisting of constant questioning and criticism of theatre and its relation to the audience. It would seem that in Centrala’s case, these are essentially only 'staging devices' to show that in Centrala 'everyone does everything'. ORESTES by Eurypides, directed by Michał Zadara, premiere: 27.08.2016, Zacheta National Gallery of Art in Warsaw, produced by Centrala. Photographer: Krzysztof Bieliński. Since Centrala is dependent on artistic institutions and uses their financial and infrastructural resources (or even, as the artists themselves put it, 'takes advantage of their resources'), it cannot openly criticise the production relations operating in them. The artists declare that they work with venues in mind in which the shows are going to be rehearsed, and attempt to thematically refer to them, but rather on the basis of casual references to their tradition and history, and not by reflecting on the production relations that govern them. Their collaboration with the Museum of Modern Art in Warsaw, which houses archives and a collection of Alina Szapocznikow’s works, provoked the creation of Szapocznikow: No Gravity, based on the artist’s biography. Orestes, which questions the condition of Polish democracy, was created in the Zachęta National Art Gallery, where in 1922 the first democratically elected president after Poland regained independence, Gabriel Narutowicz, was assassinated, which triggered a constitutional crisis. Orestes was performed in March 2017 at the Mysia 3department store – the topic of the show is universal enough for it to function outside of the institutional framework of the Zachęta Gallery. The creation of Szapocznikow, meanwhile, was connected with a significant anniversary in 2013 of the artist’s death, and was co-funded by the Ministry of Culture and National Heritage. The Warsaw Row had also been an anniversary show, prepared for the 67th anniversary of the Warsaw Uprising. It seems therefore that the proclaimed site-specific strategy is not so much a conscious attempt at entering a critical dialogue with the traditions and infrastructures of selected institutions, but rather a circumstance caused by financial and structural dependencies. It is close to the phenomenon termed 'grantosis', the primary symptom of which, according to the curator Kuba Szreder, is 'increased interest in topics that are currently supported by grant-giving organizations'.22 The artists of Centrala modify their message in such a way – especially at the level of public relations – so as to suggest intentional interest in the subject matter offered by the institutions, and subsequently incorporate it into their statutory goals. At Centrala, no one has a full-time contract, work is precarious in character, uncertain – which is appreciated by the company members. Why? People at Centrala emphasise that it is their choice to be part of the collective (as Arkadiusz Brykalski mentions in an interview, 'because we like each other, because we share common goals and choices'). Economic motivation is not an incentive for work there, largely because the artists compensate for it with their work in institutional theatres. In any case – there'd be no fund from which to pay temployees anyway – money brought in through grant competitions, sponsorships and ticket sales is spent on further projects. Orestes, along with being financed by creative scholarships awarded to Zadara, Robert Rumas and Arek Ślesiński by ZAiKS (the Polish Society of Authors and Composers), was also created largely thanks to what Centrala earned during the US tour of Chopin Without Piano. It is Zadara’s dream for Centrala to become a foundation maintaining itself from its own endowment fund, therefore independent of grants and sponsors – but that could only be possible after decades of operation, perhaps even a century. Not only does one not make money at Centrala, it's sometimes necessary to subsidize the production budget from one’s own pocket. As Marta Kuźmiak explains: 'we invest practically everything in Centrala, and we live off the things we do outside of it […]. We spend money on other purposes, and not on our own fees, because we know it will eventually pay off '.23 One's not in it for the money, then. That's why at times one has to look for fringe benefits to encourage people to work. Zadara, in persuading photographer Krzysztof Bieliński to shoot a Centrala show, and not having money for his fee, proposed that he'd make a production in which Bieliński's photos would play the main role – and that's how 10 Political Songs was created. Bieliński is generally the photographer for Zadara’s productions in institutional theatres. The ideal volunteer, but also employee, of Centrala is a person able to dodge boring and restrictive procedures, dump waste illegally then immediately set off to the IKEA store at the outskirts of the city to buy a bag needed for the production and deliver it within an hour and a half. Paradoxically, in exploiting volunteers Centrala sees one of the areas in which its public mission is realized, as it grants them close access to the artistic process, usually sealed off behind the doors of public institutions, and gives them the opportunity to gain work experience. Zadara seconds Kużmiak by proving that Centrala may exploit volunteers but doesn't spare themselves: 'We work in such a way that everyone does everything, and there is no job for which we would be too important, for example, we would not be too dignified to clean the toilet'.26 These statements reflect the identity of artistic subjectivity (being the ideal of contemporary capitalistic subjectivity) discussed by Luc Boltanski and Eve Chapiello in The New Spirit of Capitalism. Centrala members are constantly active, and they ceaselessly aspire toward realizing their potential – they are multitasking, self-exploiting entrepreneurs and efficient self-producers. Contrary to all appearances, in many public institutions the case is similar. 'Lightness' and the lack of permanent premises is perceived by Centrala members as their strength, because their energy doesn't have to go into administering a building or maintaining job positions. On the other hand, they expose the need for stabilizing the situation, which would be accomplished by transforming Centrala into a foundation. 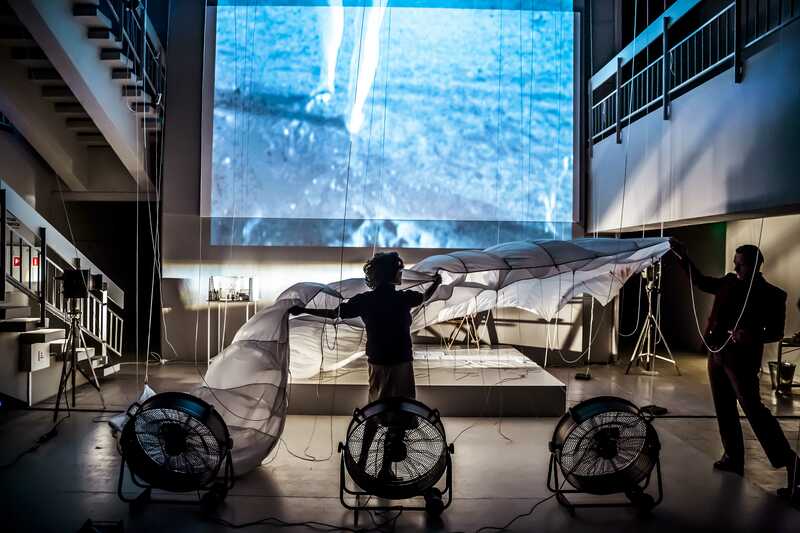 Interdisciplinary Centrala wants to broaden its spectrum of activity, branching out beyond theatre and pursuing other fields of art (film, installation, concert, architecture). Centrala plans to make films and hold exhibitions, as well as reach out to the world of business and create new marriages of art and business. For the time being, however, the group focuses exclusively on the creation and production of theatre works. This all makes Centrala far more innovative and efficient than artistic institutions, in the eyes of its members. Multifunctionality makes them respect their time more, as Zadara claims, thanks to which they work faster. Kuźmiak, in the context of flexibility, raises the subject of saving and economy. This efficiency grants insight into how to harness the potential of artistic institutions and their squandered resources. The need for efficiency is very much connected with Zadara’s fascination with contemporary marketing and management, as will be discussed below. Centrala’s team are part of the projectariat analysed by Kuba Szreder Fabryka sztuki. Raport z badań Wolnego Uniwersytetu Warszawy [The Art Factory. An Excerpt from a Report by the Free/Slow University of Warsaw] and ABC Projektariatu. O nędzy projektowego życia [The ABC of Projectariat. On the Misery of Project-based Life]. The projectariat is characterized by the fact that its representatives can rely on nothing but their willingness to participate in a project. This does not apply in the case of the Centrala team, however, because the people forming it have for the most part lucrative jobs in public institutions and don't have to participate in projects to survive. Precarity, as a state of constant uncertainty and dependence on someone else’s favour, doesn't concern them – Centrala is a precarity they can afford, precarity out of choice, the negative effects of which are offset. As Szreder writes: 'For most art people precarity is not a result of structural coercion, but rather it appears as a result of one’s own choices, a side effect of enthusiastic engagement in project creation or the cost of sacrifice for art'.28 Centrala members are fascinated by their life within the project, bearing the insignia of micro-entrepreneurs who 'have their own human capital at their disposal, as well as knowledge, experience and contacts which they must invest with potential profit in mind'.29 This is connected with exploitation of the enthusiasm displayed by Centrala members and volunteers – and quite a number of similar independent initiatives are fuelled in this manner. 'Ideas came first, and only later did appear people who wanted to participate in them', claims Zadara speaking of the beginnings of Centrala, which he calls 'a collection of procedures'. What procedures does he mean? The key here is the 'high level of performing activities related to art', along with the fact that these procedures are in a way independent of who implements them. Their transparency and 'lightness' is what makes Centrala different from public institutions ('It was a move towards an economy of information', says Zadara. 'Thanks to insistence on procedures and knowledge you can dispense with the burden of institutions'). The procedures referred to by Centrala’s leader are to allow for taking quick action and ensure everything runs according to plan and cost estimate. This frequently happens at the expense of exploitation of others, however. These procedures are in fact a lack of rules granting apparent independence, which is a value strongly enforced by Centrala members ('Centrala is transparent, independent and flexible'; 'Centrala is an independent organization producing shows'). The stars occupying the main spot at the top of the artistic hierarchy at Centrala are Michał Zadara and Barbara Wysocka. Zadara is one of the most recognized and popular Polish theatre directors: since graduating from the Academy for the Dramatic Arts in Kraków, he has directed some fifty productions (mostly in institutional theatres), installations and independent films in Poland, Austria, Germany, Israel and the US. Even though Centrala in theory has no hierarchy (as emphasized in conversation with Marta Kuźmiak: 'Centrala differs from a standard model of a theatre company in that it is not a group of actors gathered around a charismatic leader31), Zadara is definitively the collective’s leader, its artistic director. He is the one to decide on projects Centrala will carry out. The other star of the collective is Barbara Wysocka: actress and director, graduate of the Academy for the Dramatic Arts in Kraków, privately partners with Zadara. Wysocka performs lead roles in almost all Zadara productions. She also has directed very interesting productions with important Polish companies – these include Franciszek Bohomolec’s Pijacy [Drunkards] at the National Stary Theatre in Kraków, Philip Glass’s The Fall of the House of Usher at the Teatr Wielki – Polish National Opera, Georg Büchner’s Lenz at the National Theatre in Warsaw, and Shakespeare’s Julius Caesar at the Powszechny Theatre in Warsaw. As a member of Centrala, Wysocka directed Szapocznikow: No Gravity. SZAPOCZNIKOV. NO GRAVITY, directed by Barbara Wysocka, premiere: 11.04.2014, produced by Centrala, co-produced by Museum of Modern Art in Warsaw, Polski Theatre in Wrocław. Photographer: Krzysztof Bieliński. Eclipsed by thee two celebrities is the rest of the collective's 'artistic department': Arkadiusz Brykalski, Jan Duszyński, Robert Rumas, Artur Sienicki, Arek Ślesiński and Krzysztof Bieliński. Below them is situated the 'administrative department': Marta Kuźmiak, Anna Czerniawska, Magdalena Zadara and Oliwia Ziębińska. Together, they create the 'dark matter of the arts'. This is a phrase formulated by Gregory Sholett in Dark Matter: Art and Politics in the Age of Enterprise Culture (which Kuba Szreder translated into Polish). This artistic dark matter is created most frequently by aspiring and failed artists, art curators, theorists, technicians, assistants and administrators. Their work usually remains in the shadows, and they are connected by their lack of visibility. The dark matter is necessary so that, as Szreder writes, 'the star galaxies would not fall apart under their own centrifugal forces'. It maintains 'the cruel economy of art' based on stars monopolizing the bulk of prestige, contacts and attention. Its work is indispensible – as is exemplified by Kuźmiak, who produces, coordinates and plans everything Centrala does. Networking and Cooperation with Public Institutions: Parasitism or Symbiosis? From its inception, the idea of Centrala assumed the collective's collaboration with art institutions and its using those institutions' potential to produce works, which came out of years of experience its members had working in such institutions and the awareness that those institutions have a lot of untapped resources. The institutions’ wastefulness and their clunky structures became a subject of criticism, though most often it is these institutions that contribute material and human capital to Centrala. To date, Centrala has collaborated with the POLIN Museum of the History of the Polish Jews, Sinfonietta Cracovia, the National Library, the Nowy Theatre in Łódź, the Powszechny Theatre in Warsaw, the Zachęta National Art Gallery, the Museum of Modern Art in Warsaw, the Juliusz Słowacki Theatre in Kraków, the Warsaw Uprising Museum, the Nowy Theatre in Warsaw and the Zbigniew Raszewski Theatre Institute. As I have described above, each of these productions symbiotically entered a dialogue with the venue it was created in. What's more, networking is imbalanced – persons and institutions at the centre of the network have the greatest influence, and are the most visible. This is Centrala’s ambition, and, as its very name points out, the collective wishes to be at the centre of the network (Centrala is a space that 'creates connections, so that something could happen through those connections'34). The collective is for the most part associated with Zadara, who is the only one to speak about it in the media, and thus controls the flow and generates connections. In connection with the 250th anniversary of public theatre in Poland, celebrated in 2015, numerous books were published devoted to public theatre and its mission. The most important was the translation of Dragan Klaić’s Resetting the Stage: Public Theatre Between the Market and Democracy into Polish.36 Klaić's pretext for writing the book, however, was not the anniversary of Polish public theatre, but instead dynamic social processes at play: advancing globalization, digital revolution, European integration and the liberalization of economy. For Klaić, public mission consists not only of the tasks and functions of theatre, but also systemic solutions that decide the shape of an institution. Institutional stability is important, as it allows for the maintenance and development of a theatre ensemble and the implementation of a long-term repertoire policy. Above all, he emphasizes the necessity of maintaining public theatre’s independence from market mechanisms. The scholar Dariusz Kosiński writes on this subject in 'Teatr publiczny – azyl pod napięciem' ['Public Theatre – Shelter Under Tension']. Since public theatre is financed by public money, it doesn't operate for profit, but rather for the public benefit. Kosiński refers to the mid-century director and theoritician Juliusz Osterwa and his conclusion that 'theatre is not an enterprise, but rather an undertaking'. Zadara wrote one of the essays commissioned by the Theatre Institute in Warsaw on the occasion of the public-theatre anniversary, in the Teatr publiczny – narracje series [Public Theatre – Narrations, which included Kosiński’s text].37 Centrala is presented in it as a model for public theatre. Unlike public theatre, however, the collective has a clearly and explicitly formulated mission: 'the creation and performance of productions of the highest level of quality and innovation, with minimal bureaucracy and technical infrastructure'. Zadara postulates that theatres should have their own missions formulated in similarly simple ways, which could guarantee the functioning of the entire system. He then begins detailed deliberations, overthrowing misconceptions (in his view) about public theatre one by one – for instance, that it requires employing actors on full-time contracts. Applying a comparison with public transportation, he states that he does not consider caring about decent working conditions to be necessary for the proper functioning of an institution and the fulfillment of its public mission: 'Public transport does not exist for the best bus drivers to traverse amazing routes, but to transport a lot of people cheaply. The goal requires specialists to drive the vehicles'. Public theatre – as with public transport – should be accessible to all and present productions people want to see on their own accord (where here are the challenges placed before audiences, as described by Kosiński?). Zadara unequivocally emphasizes being audience-oriented, not company-oriented, and writes: 'the goal of public theatre is its public, not theatre'. The turn towards the audience is associated with low ticket prices (he also mentions this subject in the interview I conducted), and with working with local artists. Finally, Zadara formulates a definition of public theatre: 'Public theatre looks to the cultural development of all inhabitants of a region identified by the organizer, by producing and making accessible to them theatre shows and by creating various opportunities'. Writing and talking about the mission of public theatre, Zadara therefore combines it with dependence on the market, sales and contemporary marketing. The director, however, has not always held such views. Where did such a radical change of course come from? At the beginning of this article, I wrote that the stimulus for establishing Centrala was an encounter with the economist Jerzy Hausner. The first meeting, in 2009 at the Congress of Culture, ended in conflict. Two concepts collided at the congress. The first was presented by Jerzy Hausner and Leszek Balcerowicz, who argued for curtailing patronage and state control and unleashing market rules in culture. Pathologies of state-dependent institutions were mentioned: clientism, elitism, extravagance and the strong role of trade unions, as well as dependence of institutions on politicians and officials. Speeches by the two economists caused outrage among participating artists including Zadara, who saw in the proposed liquidation of state patronage a real catastrophe and the collapse of Polish culture. Zadara also attacked Hausner’s view that there are other possible forms of ambitious artistic activity than institutional theatre. These polemics moved on to the press, where in response to an interview that Roman Pawłowski conducted with Balcerowicz, Zadara spoke unequivocally against the economists and the ruthlessness of the free market. Another meeting with Hausner took place in 2010 and was already more conciliatory, happening during the development of the 'Pact for Culture' proposed by Hausner. This was a social contract, the project for which spurred formation of the so-called Citizens for Culture (including economist Henryka Bochniarz, culture manager Beata Chmiel, economist Jerzy Hausner, poet and ngo activist Jarosław Lipszyc philosopher Andrzej Mencwel, publisher Beata Stasińska and journalist Jacek Żakowski), responding to postulates of the congress in 2009.42 The following year, the GAP Artistic Agency was established – an organizational unit of the Foundation for Economy and Public Administration (presently functioning separately as the Social Enterprise GAP Artistic Agency PLC, which cooperates closely with the Foundation for Economy and Public Administration in the field of cultural and entertainment ventures). GAP is carrying out some two dozen projects at a time, of varying scale and addressing different targets. It gains its funds mostly through sponsorship and grants, and partly from ticket sales for performances or events. In 2011, this 'social enterprise' seemed to Zadara the ideal entity for producing Chopin Without Piano, and GAP has regularly supported other productions by Centrala since then. In a sense, Centrala was born from Hausner’s ideas – who supports the thesis that economics must be changed through culture and is convinced of the key role of culture in contemporary economy. Hausner also claims that it is possible for a private business to operate that could be artistic, non-profit and non-commercial, all at the same time, which makes it an equitable model functioning alongside the system of public institutions and fulfilling similar missions. Zadara and Hausner have exerted a tremendous influence on one another – Hausner’s ideas opened a radically institutional director to free-market activity, while cooperation with Zadara has enabled the development of the social-enterprise model initiated by the GAP economist. Friendship with Hausner was not the only thing to instil a fascination with contemporary marketing and management in Zadara. While studying in the US at the department of political science at Swarthmore College, he worked at one of the top PR agencies in New York City – where he learned marketing thinking. This youthful fascination revived when Centrala was created. We can see its traces in the director’s remarks – while discussing his artistic activity he often uses terms such as competition, market, resources, capital and efficiency: 'I envy corporations and I’m fascinated by what management looks like today. Management and law are the most interesting areas of life today. If you learn good management, you can change the world. In theatre – not so much'.43 According to Zadara, the market is good because it allows one to profit from enthusiasm and passion, and the corporate model is what public theatre should take as its inspiration. Zadara even sees public mission as competing with other theatres. The founding of Centrala happened at the moment when Zadara had achieved success in public theatres. In short, in a situation in which the director could afford to take such a risk. He was directing four or five new productions a year at the time, and began receiving awards – the wave of success was triggered by Chopin Without Piano, its international touring and awards at festivals. In 2014, he received the Konrad Swinarski Award from the journal Teatr, and in 2015 he won the first edition of the Classics Alive competition. The director claims, however, that he is implicated in a 'public trap' which prevents him from diverting his energies into commercial activity. Is he teasing, or does this prove the fact that it is impossible to combine market mechanisms with a public mission? The idea for Centrala was born in opposition to public institutions, which is why one can think of it as a kind of a 'pata-institution' as described in the introduction to this article. However, the artists still have not reflected on the mechanisms of their own work. Strong capitalist tendencies in the minds of Centrala’s creators bring to mind Bojana Kunst’s critical analyses. Kunst criticizes post-Fordist work methods inherent in institutions and the adoption of capitalist principles to work in institutions, which in turn makes them virtually 'production houses, factories'. For it often happens that even the most progressive organizations duplicate the same models of functioning that they condemn in their activity. 1. In 2017, as this paper was being completed, the collective’s numbers have changed slightly: Centrala no longer includes Anna Czerniawska and Oliwia Ziębińska, while Anita Cieślicka has joined its ranks. 2. See www.centralateatr.pl [accessed on 21 January 2017]. 3. In the first interview, which was a kind of a focus group, I talked to Michał Zadara, Marta Kuźmiak and Arkadiusz Brykalski (8 December 2016). The second was an individual conversation with Michał Zadara (12 January 2017). 4. See Theatre in Poland: Season 2014/2015 (Warsaw: Zbigniew Raszewski Theatre Institute, 2016), pp. 33–50. 5. See www.centralateatr.pl [accessed on 11 March 2017]. 6. „Wszyscy byli odwróceni” w Muzeum Historii Żydów Polskich, www.e-teatr.pl [accessed on: 27 March 2017]. 7. Gregory Sholette, Dark Matter: Art and Politics in the Age of Enterprise Culture, London-New York, 2011, pp. 152-153, quoted after: Kuba Szreder, ABC Projektariatu. O nędzy projektowego życia (Warsaw: Fundacja Bęc Zmiana, 2016), pp. 89–90. 8. Kuba Szreder, ABC Projektariatu. O nędzy projektowego życia (Warsaw: Fundacja Bęc Zmiana, 2016), p. 89. 9. Szreder, ABC Projektariatu. O nędzy projektowego życia (Warsaw: Fundacja Bęc Zmiana, 2016), p. 90. 10. From an interview with the author on 8 December 2016. 11. Marta Kuźmiak, Inny system sensów, www.e-teatr.pl [accessed on 1 February 2017]. 12. Co-producers listed in parentheses. 13. Bojana Kunst, Artist at Work: Proximity of Art and Capitalism (Warsaw, Lublin: Zbigniew Raszewski Theatre Institute, Theatre Confrontations Theatre Festival, 2016), p. 60. 14. Wokół teatru popularnego, www.e-teatr.pl, [accessed on 3 April 2017], reprint from Dialog, 9 (2016). 15. Witold Mrozek, 'Dziady Zadary we Wrocławiu. Trzecia część w pięć i pół godziny', wyborcza.pl [accessed on 28 March 2017]. 16. Katarzyna Czeczot, 'Wygładzanie szwów', dwutygodnik.com [accessed on 28 March 2017]. 17. Giorgio Agamben, Profanacje, trans. Mateusz Kwaterko, (Warsaw: PIW 2006), p. 106. 18. Katarzyna Waligóra, Po co nam fortepian, kiedy jest Wysocka?, www.e-teatr.pl [accessed on 4 February 2017]. 19. Waligora, Po co nam fortepian, kiedy jest Wysocka?. 20. 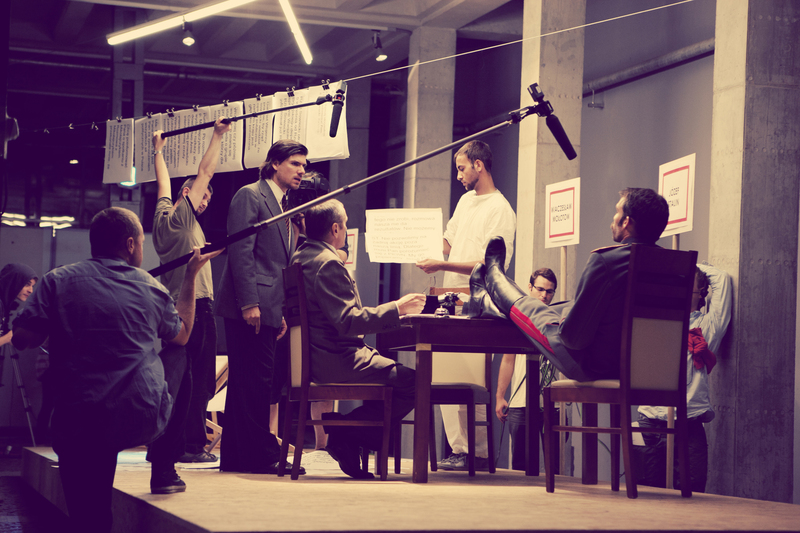 The production was created as part of the series Project P organized by Teatr Wielki – Polish National Opera. Project P showcased pieces by young opera composers working with young directors, forming part of a broader cycle, Terytoria [Territories], devoted to contemporary music. 21. Kunst, Artist at Work, p. 111. 22. Szreder, ABC Projektariatu. O nędzy projektowego życia (Warsaw: Fundacja Bęc Zmiana, 2016), p. 47. 23. Interview conducted on 8 December 2016. 24. Interview, 8 December 2016. 25. Interview, 8 December 2016. 26. Interview, 8 December 2016. 27. Interview, 8 December 2016. 28. Szreder, ABC Projektariatu. O nędzy projektowego życia (Warsaw: Fundacja Bęc Zmiana, 2016). 31. 'Powstała Centrala', www.e-teatr.pl [accessed on 3 April 2017]. 33. Szreder, ABC Projektariatu. O nędzy projektowego życia (Warsaw: Fundacja Bęc Zmiana, 2016), p. 109. 34. Interview with Zadara, 8 December 2016. 35. Interview with Zadara on 12 December 2016. 36. Dragan Klaić, Gra w nowych dekoracjach. Teatr publiczny pomiędzy rynkiem a demokracją, trans. Edyta Kubikowska, (Warsaw, Lublin: Zbigniew Raszewski Theatre Institute, Confrontations Theatre Festival 2015). 37. Michał Zadara, 'Nie wiemy, co gramy – ku definicji teatru publicznego' www.250teatr.pl [accessed on 3 April 2017]. 38. Teatr 6. Piętro is a private theatre in Warsaw co-owned and managed by Michał Żebrowski and Eugeniusz Korin. It is located in the Concert Hall on the sixth floor of the Palace of Culture and Science. 39. Nowy Theatre is a Warsaw theatre established in 2008 with the production of (A)pollonia directed by Krzysztof Warlikowski. 40. Teatr Rozmaitości, known as TR Warszawa, is a theatre founded in 1949 as the State Variety Theatre in Warsaw. Grzegorz Jarzyna has been its artistic director since 1998. 41. Interview, 8 December 2016. 42. The main premise of the Pact was an increase of cultural expenditures to 1 per cent of the state budget, signed by Minister of Culture Bogdan Zdrojewski in 2011. 43. Interview, 8 December 2016. 44. Interview, 8 December 2016. 45. Edward Dziewoński’s Kwadrat Theatre is a Warsaw theatre, which has been staging mostly comedies and contemporary farces for over forty years.